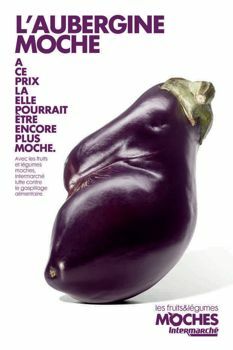 Watch out in your local Intermarché for a new campaign «les fruits et légumes moches» in which they are selling ugly or poorly sized fruits and veg at reduced prices! Their appearance may not be as pretty or wholesome looking as we have come to expect from our fruit and veg but the Intermarché message is that ugly fruit and vegetables taste just as good as the lookers! It is estimated that 40% of fruit and vegetables are not up to the standards of beauty imposed by the buyers, and end up being wasted. Fruit and vegetables have feelings too. Save one today!